Filling Range (g/ml) Up to 50 ml. 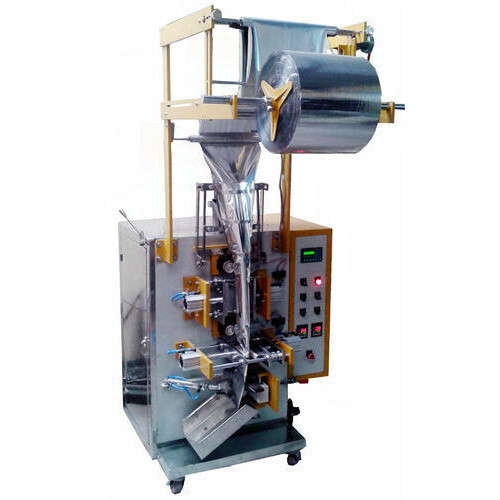 Grease Filling Machine Single Track Pneumatic FFS Machine With Piston Filler. Sealing Through pneumatically activated jaws. Feeding systems Piston filler with pump. Packing Film Continuous heat sealable laminated film in roll form with eye marks. Film draw mechanism Through Clutch and brake. PLC Yes, Mitsubishi/ Messang make. Temperature Controller PID Based, standard make. Registration on Film (Photo mark) Yes. Electrical motors GE / Crompton. Electrical Supply & Requirement 3 x 415 V AC +/- 10%. Approx 2.5 KW. Compressed Air required 6 CFM @ 6 Bar. Esskay Trading Corporation”, was founded in the year 1984, we are a renowned manufacturer, trader, supplier and exporter of a high-class assortment of Lathe Machine, Drilling Machine, and Shearing Machine. These are manufactured by our professionals using a higher quality material with the help of supreme latest technology in compliance with set industry standards. The offered products are highly appreciated by our valued clients for their features like perfect finish, high strength, corrosion resistance, durability and high performance. Additionally, we offer these products in various specifications at market leading price to the customers.We also provide the Detergent consulting service to our client. Owing to our team of skilled professionals who hold in-depth knowledge, we make sure to offer the best quality products to our precious patrons. Our experts sustain closeness with the patrons to meet their specific requirements. Further, our quality personnel checks the entire product array on numerous quality parameters to deliver our customers with flawless products. In order to source these products, we are supported by a wide vendor base. With the aid of procurement agents, we have selected our vendors on the basis of customers’ response, delivery schedule, business policies, quality standards, etc. Our vendors enable us to offer high-quality products that are manufactured at par with the international quality standards. Further, our vendors maintain strict quality policies to bring forth perfect products for our customers.